*Need A Website? Larry Chandler's oldest son, who designed this site, for more information. Call Chris at 256-659-5909 for more information on web design. Do not call for herbal root questions, please. Want to Start Your Own BackYard Nursery Business? 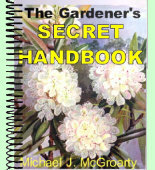 Let Michael J. McGroarty show you all the tricks of the nursery trade for plant propagation! This man is a wealth of knowledge when it comes to making plants grow and how to start your own backyard home based business, doing the thing thing that you love most... gardening! Learn how he makes thousands each year selling plants on his driveway! No kidding... Cold Hard Cash! Go to http://Free.nursery-plants.info for more information! *Need A Website? , Larry Chandler's son, who designed this site, for more information. Call Chris at 256-659-5909 for more information on web design.